Maku‘u Farmer’s Market doesn’t always have a big wheel with prizes for each person who gives it a spin, as there was on Sunday, Nov. 3. 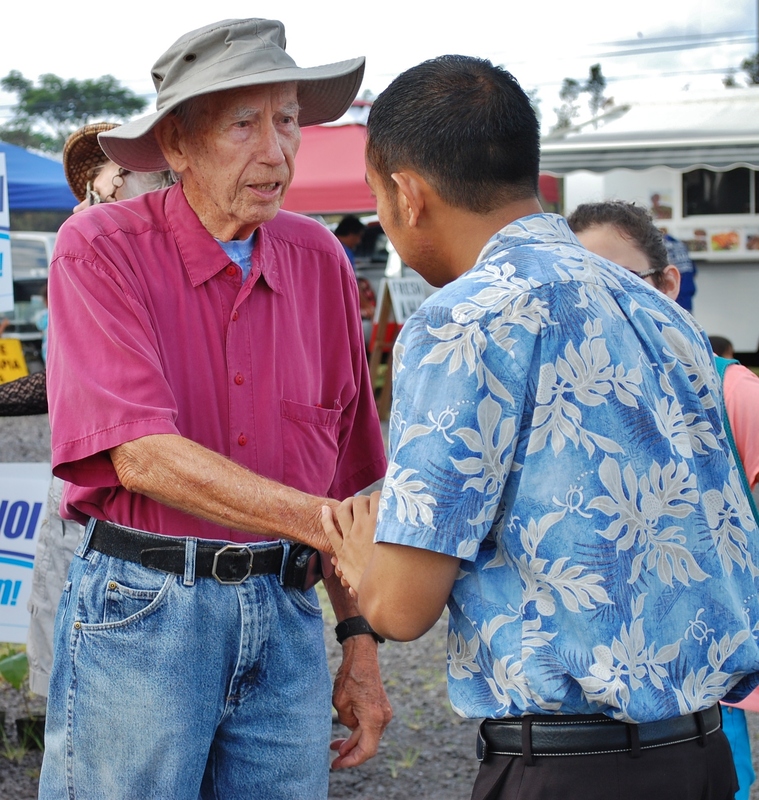 It was a part of Greggor Ilagan’s final few days of campaigning and his final Sunday at Maku‘u Farmer’s Market before Election Day. 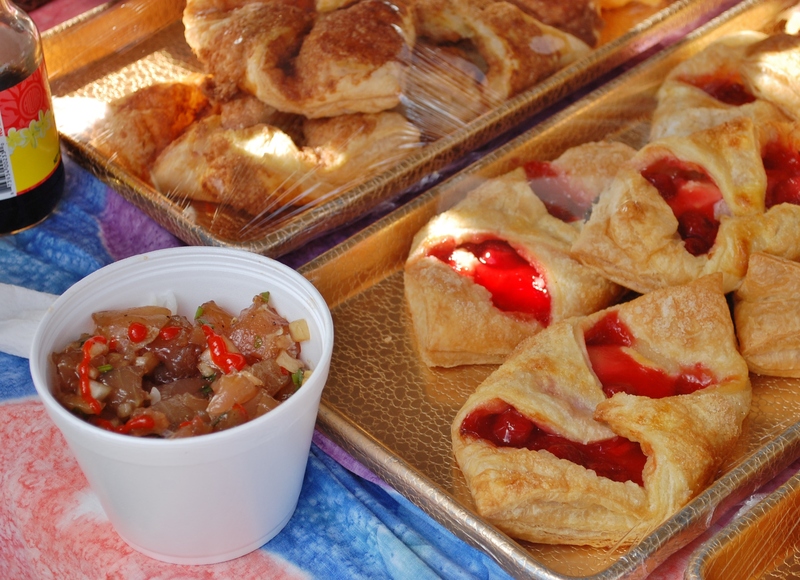 The prizes were plate lunches and drinks from the various food vendors around the market. Free poke bowl from vendor Pooki’s Cookies, a prize from the wheel. The Sunday before that, the candidate and a few volunteers passed out over 300 Bradda Pops, says Ilagan. Ilagan has been at market consistently throughout the campaigning period, taking the time to chat with patrons and community members he could be representing if elected. Ilagan is running against incumbent Fred Blas for the County Council District 4 seat on the Big Island. For more information on the candidate, check out my previous posts here and here. UPDATE 11/7: Congratulations to Ilagan on his election into the councilmember seat and to Blas for his effort. The final result between Ilagan and Blas was 59.2 percent and 37 percent, respectively. To view the rest of the election day results, please visit the final summary report. If you’ve hit that after-work rush hour traffic on Highway 130, chances are you’ve seen the blue-T-shirt-wearing sign-wavers out there, rain or shine, driven by a commitment to support someone they believe in. Or, perhaps you’ve been to the Maku’u Farmers Market recently and have seen the man himself, cheerfully shaking hands and “talking story” with market patrons. Layout of the Hawaii Island districts. Meeting Greggor Ilagan, the candidate running against incumbent Fred Blas for a seat on County Council District 4 in Puna, is pretty much inevitable at this stage in the game. Ilagan has been campaigning hard, and it has been paying off. After graduating from Waiakea High School in 2004, Ilagan promptly enlisted in the Air National Guard. For the years he was enlisted, Ilagan received the opportunity to travel the United States, but after six years of service, he came back to Hawaii to attend Hawaii Community College (HCC) to obtain a degree in accounting. Since moving back to the Big Island, he noticed that many of his high school friends went straight into schooling and had already received their degrees, but they were stuck on seemingly never-ending job hunts. Ilagan had been involved with the political processes of HCC, including the student government, student life council, and fee board, and he felt that representing District 4 could be a very real possibility. “The county level was not representing very well… He [Fred Blas] was good at just organizing clean-ups, but not the type to think through things,” says Ilagan. 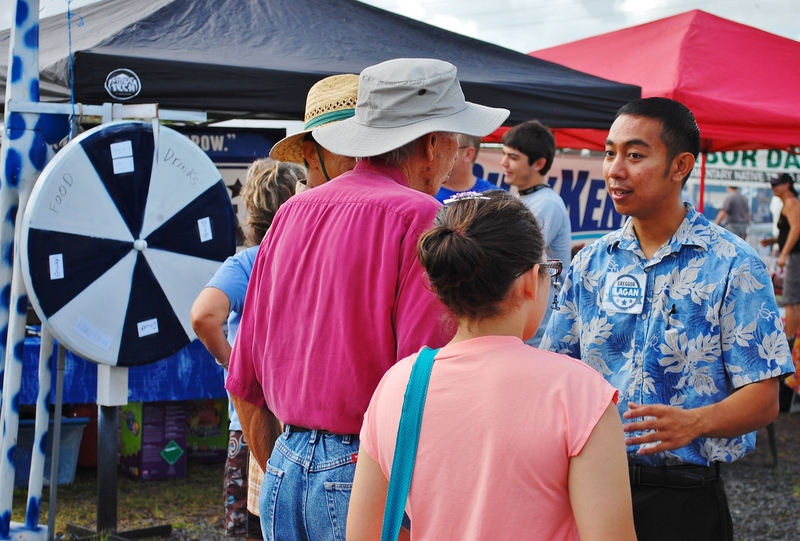 From January to early June, Ilagan and a team of supporters worked towards receiving Comprehensive Public Funding, a three-year pilot program funded by the Hawaii Election Campaign, to finance his campaign. The program requires that a minimum amount of qualifying contributions be earned for each candidate seeking funds, and qualifying contributions have to be made by check or money order, not cash. Because Ilagan had a team pulling for him, he felt all the more motivated. “We really took pride in it,” expresses Ilagan. It took a good five months, but eventually the team achieved its goal. Comprehensive Public Funding provided him $16,320 for the primary base, and later, he received $5,103 for the general base, bringing his election total to $21,423. Ilagan believes that the biggest issue that District 4 faces is the layout of Highway 130, the highway that connects Kea’au to Pahoa and, as of now, the only route in and out of the area. “There is nobody pushing because of a lack of funding,” says Ilagan. Currently, there is a two-phase project to add two lanes to Highway 130 to lessen road congestion and ultimately improve driving conditions. The creation of the Kea’au-Pahoa Road Improvements Project was created in response to the projected 2020 traffic forecast and a recommendation made by The Hawaii Long-Range Land Transportation Plan, according to the official website. Ilagan says that is a temporary solution. Indeed, according to the Puna Community Development Plan published in 2008, the population is predicted to increase to 75,000 residents by 2030, over double the population of 31,335 in 2000. “A real solution is to add an alternative route. It’s a hard battle to push for, but somebody has to get the ball rolling,” says Ilagan. Of course, Highway 130 is just one of the concerns held by community members of district 4. “I’m open to listening, understanding their needs, putting all the pieces together. I research when I’m not understanding something,” says Ilagan. Ilagan has been actively using his Facebook account to stay connected with the Big Island community. In addition to a Facebook profile that people can “friend,” Ilagan has a page where you can “like” him as a politician and inquire about his views and intentions if elected. Damon Tucker, a notable Big Island Blogger, posted on the politician’s wall, asking, “If elected, what would be the first bill you would try to pass?” To which Ilagan responded that his foremost move would be to review the new building code in hopes of making home ownership more affordable. He has a presence on Facebook, while Blas does not. This incorporation of new media into his campaign could be a reflection of the age difference between the two candidates: Ilagan is 26 years old and Blas is 61 years old. Although he maintains his online presence, Ilagan says he prefers to get out into the community to connect with people in person, noting that “the more personal the interaction, the better it is.” He has been traveling door-to-door, attending events at clubs and churches, going to board meetings, and setting up workshops, among other social events. Although he may not know it, Ilagan himself seems to be a symbol of change. He is bringing a fresh, young outlook to the politics of County Council. First Hawaiian Bank, Access Information Management and Pacific Corporation Solutions were on-site providing their disposal services free of charge at the event hosted by Hawaii’s Better Business Bureau (BBB). 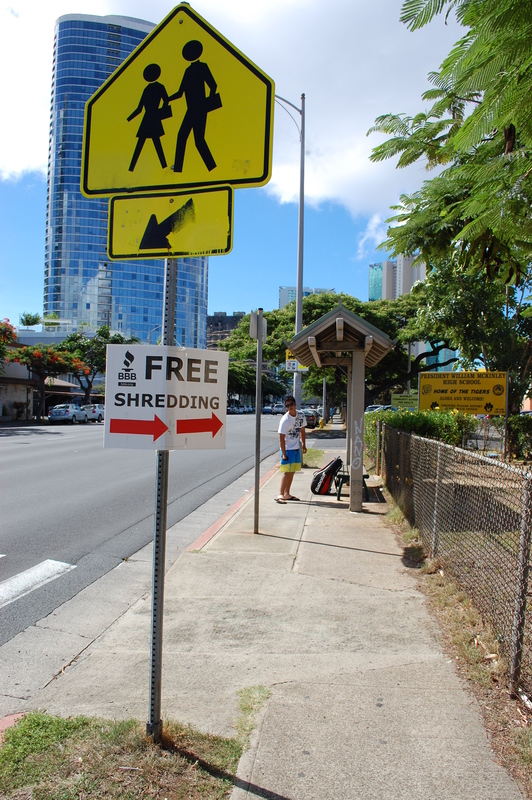 “Last year, we had a little bit short of 700 cars and a little over 14 tons of papers shredded,” says Director of Operations at Hawaii’s BBB Lisa Nakao. What is this young candidate’s campaigning style? Greggor Ilagan is a candidate for County Council District 4 in Puna on the Big Island of Hawaii. Harmonious chanting envelops the room during kirtan, a time for devotional music, every Wednesday at 5:45 p.m. at Polestar Gardens. Some people simply tap their fingers to the melody, while others become completely immersed in the music and sing along. After the kirtan is finished, a few sit in silence in the temple, letting the remnants of the songs soak into their veins, absorbing the tranquil aura of the room. A few minutes pass and everybody moves out of the temple and into the main house for a community potluck. Lined up on a table, buffet-style, are various vegetarian foods: two types of bean soup, polenta with or without cheese, fresh greens, pickled green papaya, and other more interesting dishes, such as a green paste that looks like guacamole but is actually a sweet banana pudding of sorts. 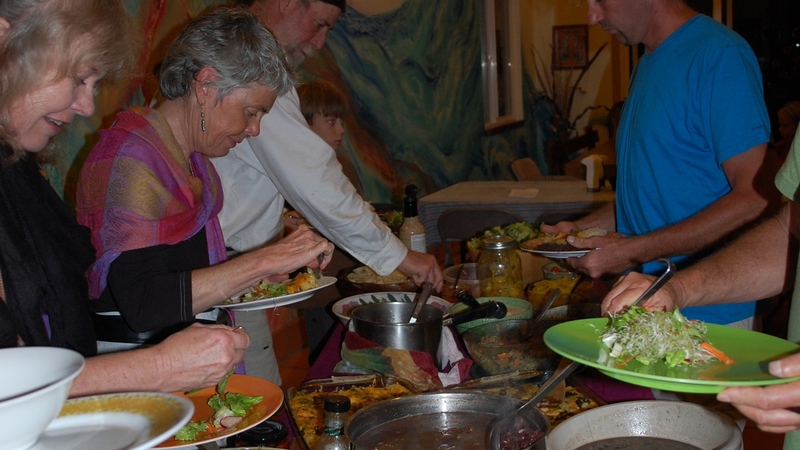 Guests are encouraged to contribute a dish to the community potluck on Wednesdays. It is not by chance that these people began a weekly kirtan. The teachings of Paramhansa Yogananda inspired Michael Gornik to launch the 501(c)(3) non-profit corporation Polestar Gardens in 2000. 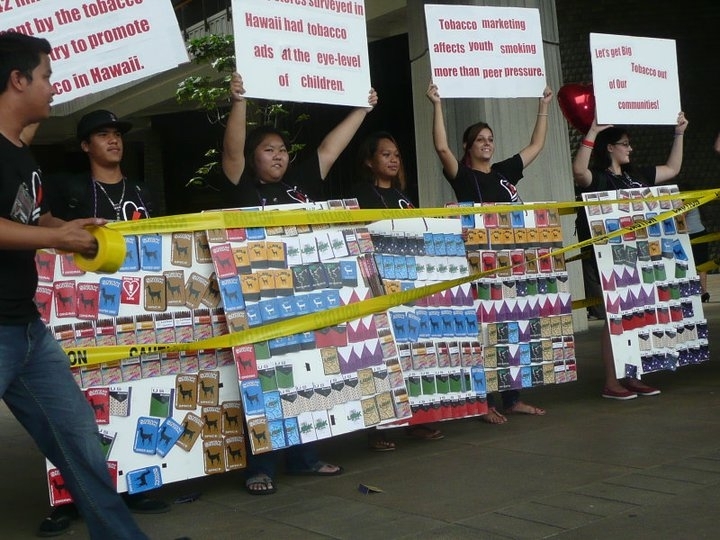 Change, lives in flux – transitions make up the 75th issue of Hawai‘i Review. “[The works feature] just moving from one space to the next,” said Editor in Chief Rachel Wolf, describing the University of Hawai‘i at Mānoa’s biannual literary journal. But more than words go into creating an issue of the journal. Visual editor Scot Lycan scoured art shows both on and off campus before he found Peter Chamberlain’s abstract artwork to use as front-cover art. “The image is striking and very bold, and we really felt it spoke to us all,” said Wolf. “His [Chamberlain’s] vision seemed to match very well with what we were going for.” Although the journal is managed by students, Hawai‘i Review accepts non-UH submissions as well. Well-known writers, such as Margaret Atwood, have been published in the past. Wolf admits that finding a completely student-run journal that also publishes from outside sources is a rarity. “We publish the best of the best, but we do try to do a good balance of students and outside submissions,” she said. Fiction and poetry have been the primary genres of past submissions, but all types of submissions – interviews or nonfiction, for example – are encouraged. Writers send in about 50 or so submissions per month, and on average 15 to 30 authors have their works published in each issue. Within the next two weeks, the winners of Hawai‘i Review’s Ian MacMillan contest will be announced. According to Wolf, the award is a major draw for submissions and attracts a large audience. Named after an award-winning short-story writer and professor at UH Mānoa, the MacMillan award honors outstanding literary pieces in two categories: poetry and fiction. The winners will be featured in the 76th issue, which is scheduled for release in early May. First Saturdays at Ka Papa Lo‘i O Kānewai are beginning again this year, starting at 8:15 a.m. on Feb. 4. University of Hawai‘i at Mānoa students and volunteers from the surrounding community come to devote their time to caring for the lo‘i, or taro patch, at the Hawai‘inuiākea School of Hawaiian Knowledge. 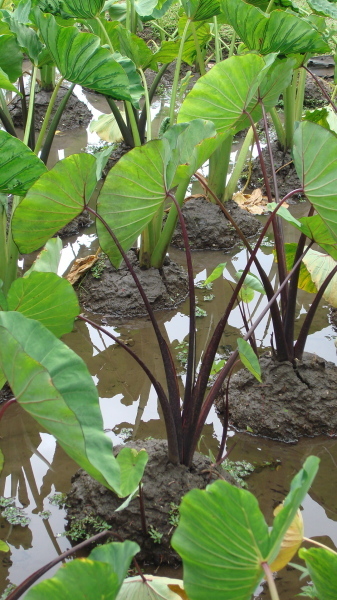 Volunteers learn to perform traditional farming practices to nurture the kalo (taro) and native plants that surround the area while spending time with family and friends. “One thing that we do here that’s a little different from other places is we make mounds to plant the taro in,” said Hiapo Cashman, the director of the lo‘i. He added that this is a traditional practice done with sugarcane and ‘awa (also known as the kava plant). Conversing in Hawaiian also gives participants the opportunity to brush up on their Hawaiian language skills. “Students know they can count on it for class,” said Cashman, noting that many students fulfill their community service hour requirements for scholarships through First Saturdays. The “Hawaiian Renaissance,” a movement to revive and preserve traditional Hawaiian culture, influenced the restoration of the lo‘i in Kānewai, according to the UH Mānoa Catalog. In 1980, UH Mānoa students found the irrigation ditch that is now the lo‘i and took an interest in restoring the area. Kūpuna, or elders, taught UH Mānoa students the traditional farming practices used to sustain the kalo in the lo‘i today. Working at the lo‘i is definitely a hands-on experience. Volunteers should not be afraid to get a little muddy. I traveled to D.C. this semester to fulfill an internship position at the Jazz Appreciation Month initiatives at the National Museum of American History. The short three-month period I had in Washington, D.C. seemed to fly by. As the date of my flight back to the Hawaiian islands draws closer, I find myself daydreaming and reflecting back on several of my experiences in D.C. and contrasting them to my previous experiences on Oahu and the Big Island. One major difference in D.C. is that public events take place all the time. I’ve attended a few great ones; the events that really stick out in my mind are the National Book Festival, National Christmas Tree Lighting Ceremony, and Taste of D.C. The greatest part of these events is that I didn’t have to spend a dime. The National Book Festival was a fun way to spend a day, with author readings, book signings and various activities to promote reading in the community. The two-day event held on the National Mall drew more than 200,000 people, according to Library of Congress news. 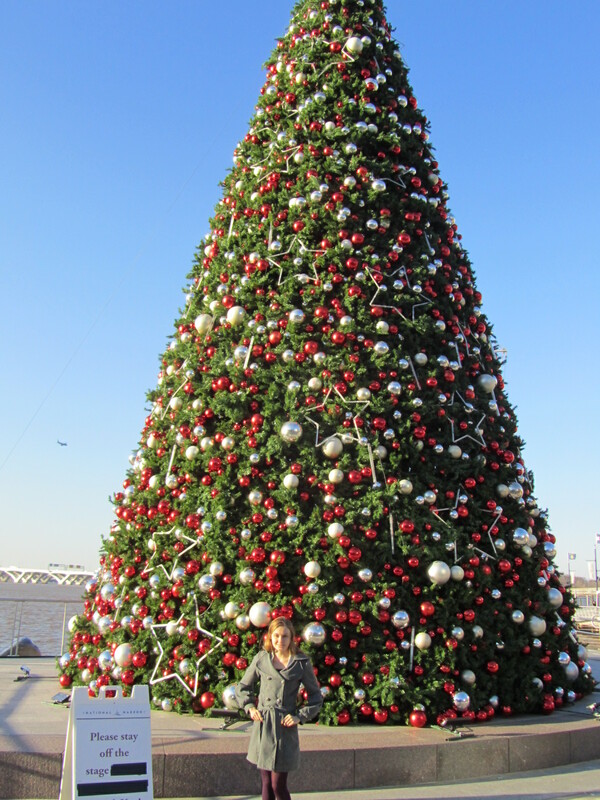 This is actually the Christmas Tree at the National Harbor in Maryland. It was windy, cold and miserable, but one of the UH Alumni treated me to lunch at McCormick & Shmick's Seafood Restaurant. Yum! The National Christmas Tree Lighting Ceremony was a more exclusive event. Patrons of this festival had to enter a lottery weeks in advance. And, even if you signed up, an element of luck has to be on your side to be randomly chosen to receive tickets. After receiving the tickets, doors open one and a half hours prior to the start of the ceremony, so attendants had to be prepared to endure 40-some-odd degree weather. My advice if you attend this winter-time festival: Be sure to bundle up! Enduring the weather was worth it, though, as I finally saw Barack Obama in person. I was determined to see him; dang it, I had better see him, I’ve spent this entire semester in D.C., after all! Other performers included Marsha Ambrosius, OneRepublic, and Kermit: there was a performer for every age group. Another really memorable festival I attended when it was warmer out, over Columbus Day weekend in October, was Taste of D.C. More than 60 restaurants lined up along Pennsylvania Avenue, close to the National Mall, to satisfy hungry festival-goers. Appetizers, entrees and desserts were passed out in exchange for tickets, which could be bought in packets of 10 for $15. A special discount of $5 was given to those who purchased 20 tickets online prior to the event. With such large number of participating restaurants, it was tough to make a decision on where to spend my precious tickets. Chili, falafels, samosas, curry, fried Oreos, waffles… The choices were seemingly endless. I walked around for an hour pondering the choices before I finally settled on a few plates that caught my eye! As my time in D.C. inches closer to the finishing point, I can say one thing for sure about this busy little city: free activities are always in abundance for the adventurous, energetic city folk. Like this article? It’s the last installment of a 3 part series. To view the previous articles, log onto harleydiven.wordpress.com. The Office of Community and Alumni Relations at Hawai’i Hall 311 is currently accepting applications for 2012 internships in Washington, D.C. The deadline for applications is March 9, 2012. For more information and application packet materials, visit http://www.artsci.hawaii.edu/alumni/students/scholarships_internships.htm.